The object of the experiment is to determine the Specific Gravity & Water Absorption of Coarse Aggregate. 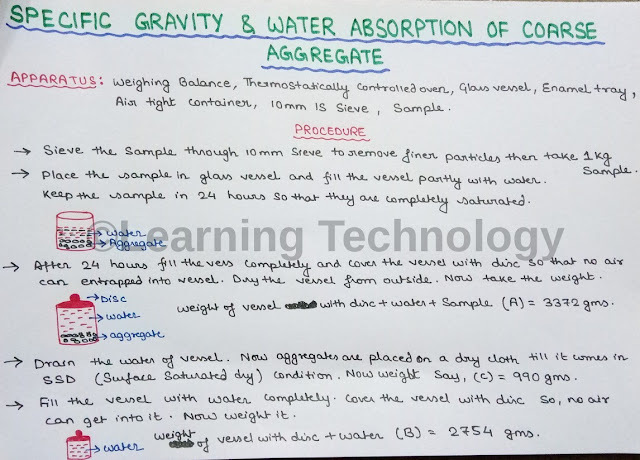 Specific Gravity is the ratio of the mass of unit volume of aggregate at a stated temperature to the mass of the same volume of gas free distilled water at a stated temperature. 1. Sieve the sample through 10 mm sieve to remove finer particles. Now take sample 1 kg. 2. Place the sample in glass vessel and fill the vessel partly with water. 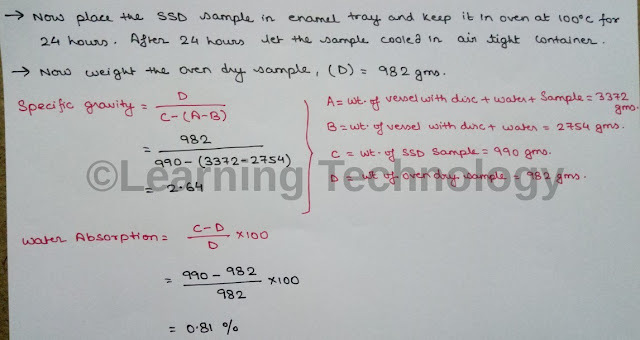 Keep the sample for 24 hours so that they are completely saturated. 3. After 24 hours fill the vessel completely and cover the vessel with disc so that no air can entrapped into vessel. Dry the vessel from outside. Now take the weight. 4. Drain the water of vessel. Now aggregates are placed on a dry cloth till it comes in SSD (Surface Saturated Dry) condition. Now weight. 5. Now fill the vessel with water completely. Cover the vessel with disc so no air can get into it. Now weight it. 6. Now place the SSD sample in enamel tray and keep it in thermostatically oven at 100 degree celcius for 24 hours. After 24 hours, let the sample cooled in air tight container. Now weight it. I Am Uploading My Hand Made Documents For You Only On Your Request, So That You Can Download It From Here. But One Thing Keep In Mind That This Is Only The Hand Made Notes. If You Want Detailed Knowledge Then Watch My Video On YouTube. I Am Telling This Because Many Important Points I Cover During Making Of Video, So If You Want To Know In Detail Then Watch My Video On YouTube. SHARE THIS POST, IF YOU LIKE IT !! LEARNING TECHNOLOGY is a Brand Platform for Civil Engineers which contains Technical Lectures on "Civil Engineering" from Personal Field Experience. This Website is authored and maintained by Civil Engineer MUKESH SAH, who is the founder of Learning Technology.